With the weather warming up plenty of insects are leaving the comfort of the ground where they hibernate and joining us on the surface of the Earth. While this gives us very helpful insects likes bees, it also brings very dangerous ones like ticks. Ticks are part of the Arachnida class, meaning that they have eight legs, and are closely related to mites. Ticks are an external parasite that feeds off of the blood of its host. While some ticks are generalists, going after mammals, birds, and even reptiles, other ticks target specific animal Classes like mammals. Almost all ticks belong to one of two major families: the Ixodidae (hard ticks) and the Argasidae(soft ticks). Both of these families perform the task of latching on to a host, normally by smell or detecting a change in the environment. Ticks go through four stages of life: egg, larva, nymph, and adult. In each one of these stages ticks need a blood meal in order to survive and grow. However, they are less picky in their younger stages as opposed to their older stages. While the thought of any animals latching onto you and drinking your blood is frightening, there are two types of this pest that people in the Northeast specifically need to look out for, as they are known to carry a horde of terrible diseases. Known in some places as the Bear Tick, the Deer Tick lives in the Northeast and Midwest United States. The tick gets its name from its habit of latching onto the white-tailed deer. However, its been seen paralyzing multiple different animals including mice, lizards, and migratory birds. The Deer Tick isn’t particularly fond of humans, they much prefer the blood of deer, but a meal is a meal. 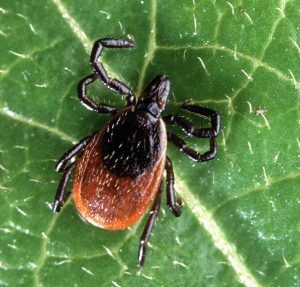 The Deer Tick is known to carry diseases such as Lyme disease and carry smaller parasites that cause diseases such as Babesiosis and Human Granulocytic Anaplasmosis. Without going too into detail any of these three illnesses are very dangerous, most being like a mix of Flu, Arthritis, and food poisoning – with a high rate of mortality. Luckily, as stated previously, these ticks don’t prefer human hosts. Still, you can identify them by the black legs they have, or the reddish color of their body when they’re attached to you. However, if they haven’t been feeding they can be even smaller than the “M” on a dime! The Dog Tick is mostly found in tall grassy areas, or areas with shrubbery, including your own backyard. The tick gets its name from commonly being found on dogs, as they’re always rolling around in the grass in their yard. However, humans can get them just as easily as dogs. While the Dog Tick doesn’t cause Lyme disease, it does carry a variety of other parasites and diseases that are equally as bad, if not worse! The Dog Tick is easily recognizable, as it’s white and brown and relatively large (compared to the Deer Tick, anyhow). One of the most stressful moments after hiking is finding a tick on you, and it’s even worse if it’s already chomped down and is embedded in you. DO NOT take a lighter to the tick or cover it in Vaseline to “choke it out” this will just kill the tick while it’s inside you, and potentially cause it to vomit into your bloodstream. The best thing to do is to take a pair of pliers, pinch the tick as close to your skin as possible, and just pull with all your might. When you’re doing this you will feel a slight pinch, but the pain isn’t too bad. Immediately after pulling the tick off of you flush the tick down the toilet or light the tick on fire, as you cannot crush a tick. Preferably you should take a picture of the tick just in case it needs to be identified later. After you dispose of the tick wash the bite area with soap and water, or disinfectant if you have it. If three to seven days later you notice a “bull’s eye” mark on your body immediately make an appointment with your doctor, this may be a sign of Lyme’s Disease. In any case, if you find a Deer Tick or Dog Tick on you make a doctor’s appointment immediately. Sadly you cannot go into the woods and spray it down with pesticides, you’d kill a lot of helpful insects if you did that. Instead, the CDC (Center for Disease Control) recommends spraying yourself down with a DEET insect repellent, wearing long pants that tuck into your shoes and a long sleeve shirt whenever you go hiking. This minimizes the chance of ticks biting you and also maximizes the chance of you finding the tick before it bites you.